Knight Rider debuted on September 26, 1982 and as a result KITT was born! KITT will always be the original smart car! Happy Birthday Buddy! Here is a slideshow of KITT's engine and transmission being installed. A special shout out and thank you to Troy, Joel, Myron, and Rudie at Hub Auto! I couldn't do this without you guys! I was not able to be there for the install, but Troy's wife Kerri took all of these pictures for me. Thanks Kerri! We entered KARR in the local car show in Aberdeen yesterday. They estimated there were between 7,000 and 8,000 people in attendance. KARR was a hit and I got to talk a lot about Project: K.I.T.T! KARR was his usual mouthy self and randomly muttered his classic lines. One gentleman was talking to me about the Fiero when KARR asked, "Now, may I take you somewhere for food?" and the guy laughed and said "Sure, I would like a Big Mac, a large fry and a Coke". We continued to talk when KARR interjected, "I have no eggs. Perhaps you can direct me to a chicken." The guy chuckled and said, "Your car may talk, but it's not very bright. Big Macs don't need eggs." We both laughed to which KARR replied, "There, did you hear. He is becoming abusive." I thought the guy was going to pee his pants he laughed so hard! There were a ton of kids that loved KARR and took a lot of pictures and videos. One little boy with a disposable camera used the entire camera taking pictures of KARR! The show was a lot of fun, and I cannot wait until the day KITT is able to make an appearance...who knows, maybe KITT and KARR will face off! If you are in the area today, KARR will be on display on Main Street in Aberdeen, South Dakota for the Sizzlin' Summer Nights car show. We are just finishing up prepping him now. The show starts at 2:00PM and runs until 8:00PM. We have a spot reserved in front of the Ward Hotel. We'd love to see you there! I took a ton of pictures at Southern Knights Atlanta, so advance warning: this post is very image-intensive. The Knight Rider Historians, Joe Huth and AJ Palmgren, decided to let KITT stretch his wheels after 30 years and let him show off a bit. KITT still has it! The Knight Rider Historians, Joe Huth and AJ Palmgren, brought a screen used KITT from the series Knight Rider. This car was also used as one of two display cars for Universal Studios. This was better than a dream come true for me. I always wanted to drive KITT, which I will be able to do with my replica, but to actually see, touch, and sit in the real KITT was just too cool! Thank you Joe and AJ for making this possible! You guys rock! First, a walk-through of all the attendees and replicas on display at Southern Knights Atlanta. Then, we watch as the real KITT rolls out of his trailer and joins the party! This is our friend Julie. Julie has loved KITT since she was four years old. In 1999, she made a special trip to Universal Studies to see KITT, but was told he was no longer on display (he was removed in 1998). She was pretty bummed! Fast forward to Southern Knights Atlanta 2016. The Knight Rider Historians, Joe Huth and AJ Palmgren, brought a screen used KITT from the Knight Rider series that was also used as one of the two display cars at Universal Studios. 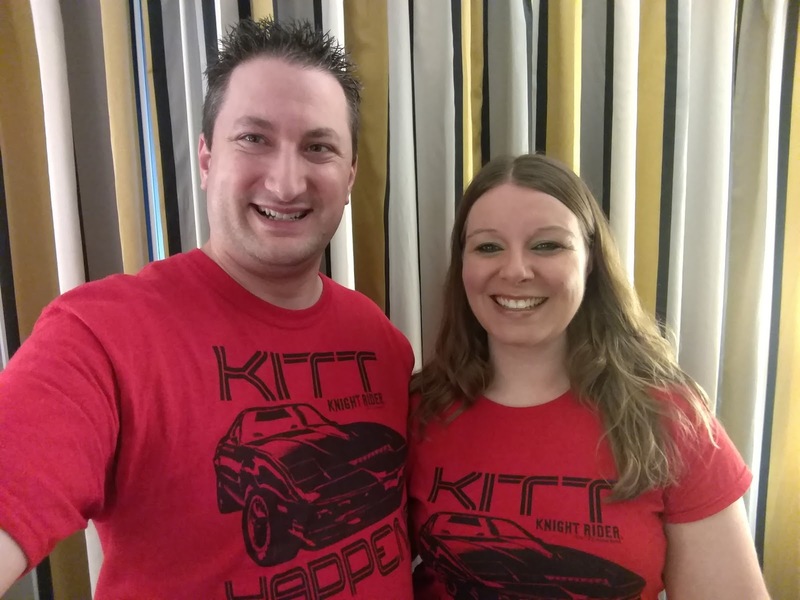 Julie missed seeing KITT in 1999, but she got to ride in him in 2016! Way to go, Julie! The Knight Rider Historians, Joe Huth and AJ Palmgren, brought a blind drive seat (used for making KITT drive on his own in the series) with them. In this video Eric Wang is trying the blind drive seat on for size! Fits like a glove, Eric! Our friend Danny is creating the F.L.A.G. Mobile Command Unit semi. He has found the correct 1980 GMC General and Dorsey trailer. This thing is awesome! Even without the Knight Industries paint scheme, I was just awestruck when he came rolling in with it! Way to go Danny - so glad you brought it down to Southern Knights Atlanta! Southern Knights Atlanta just wrapped up and we are waiting at the airport in Atlanta for our return flight. Southern Knights was AWESOME! We are so excited to share all the pictures and videos from this year's event! We have a week before our next trip, so when we got back we needed to get KITT and the garage back into shape. We put all the plastics, that were literally all over the garage, back into KITT. Troy picked up KITT over lunch and towed him back to his shop so he could install the engine and transmission. It was exciting, yet sad to see him go. We'll be waiting for you buddy! Troy called today and wants to pick KITT up tomorrow so he can get the engine and transmission installed. 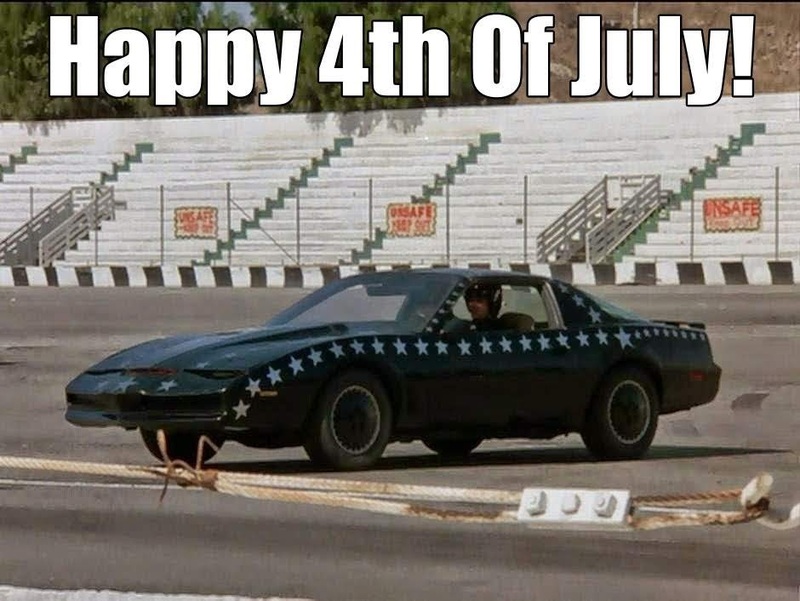 That means we had to get KITT ready to tow. First things first, even though KITT loves his roller skates, the auto dollies had to go. When we went through the tubs labeling everything we discovered that the transmission cross-member still had not been treated with POR-15. It was caked with years of road grime and oil! This is what it looked like after I sprayed the majority of the grime off with the pressure washer while it was in a tub to help contain the grease/oil.